The PlayStation Store isn’t available in all countries so it can be difficult to buy games and other content unless you have a credit card registered within the country, for example, buying games from the US PlayStation Store means you need to have a US credit card. Luckily, there is a easy way to get past this restriction through the use of a "virtual" credit card. This method has been confirmed in working for the US, Hong Kong and Japanese PlayStation Stores. Go to EntroPay.com and login (if you are a registered user) or create a new account. EntroPay creates a virtual credit card using a real card, but it does not use an address to you can use it anywhere. EntroPay charge for loading money on to your card (4.95%), so loading $10 will cost you $0.50 (total amount charged will be $10.50). There is also a charge for moving your money from the card back to your account. Once you have created a account, load some money onto your card using a debit or credit card – this will activate your card. If you wish to spend $25 on the PlayStation Store, top-up your virtual card with $26-30. On your PS3, go to [PlayStation Network] and select [Account Management]. Your card number is the long number on the card. Card Holder name is "ENTROPAY USER". 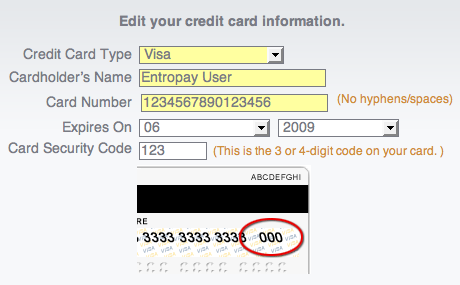 In the above example, the expiry date is "06/09" and the security code is "123". Once your card details have been entered, click on "Continue". You will then be asked to enter your billing address. Here, you can enter any address you want. Once finished, click "Continue" again and you will get a confirmation message. To load money onto your PSN Account, return to the [Account Management] screen and select [Transaction Management]. Select [Manage Wallet] and then select [Add Funds]. Select [Credit Card] and select the amount of money you want to add (the amount should be less that the amount available on the EntroPay Virtual Card or the transaction will fail). Click "Continue" to complete the transaction. You will receive a confirmation screen stating the transaction is complete. You can now go to the PlayStation Store and purchase some content. If you cannot edit you billing information on the PS3’s Account Management screen, try again after 10 minutes – it may take a while for your virtual credit card to become active. 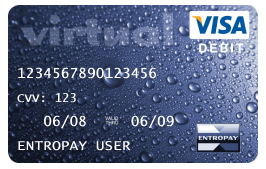 You virtual credit card must have at a balance of least $10 for it to work. hi! I have tried the way you show here. But when i enter my account it show like that “Please enter a valid credit card number”. What should I do? You need to enter a credit card number then. Or try skipping that step. You need to buy prepaid cards on ebay or amazon to add funds to your account. You cant add non US card to US account.